Eggs from your backyard chickens stay fresher if they aren't washed before storing them, but no one wants dirt- or poop-covered eggs on their counter, or worse in the refrigerator. So how can you ensure that you always collect clean eggs? 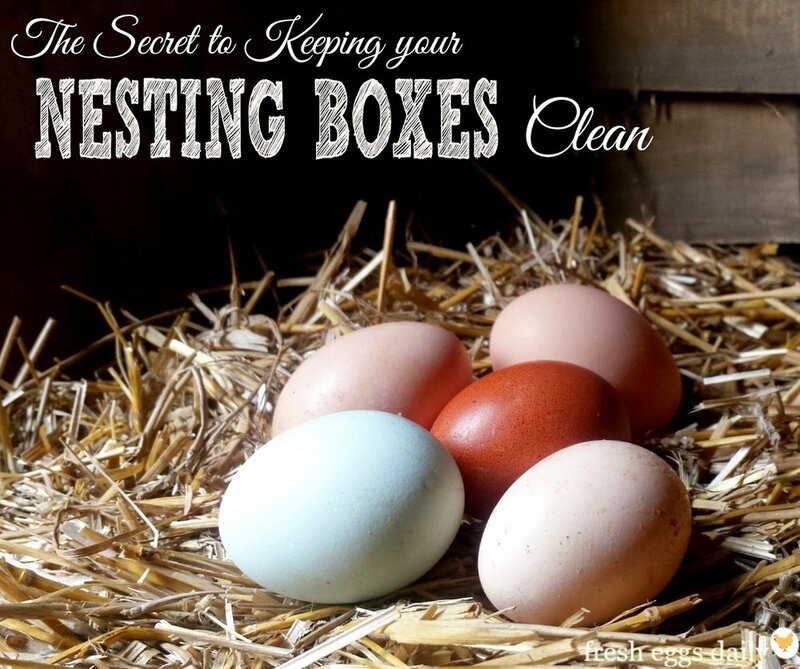 We found this helpful article on fresheggsdaily.com on how to keep your nest boxes clean and make egg collection less of a chore. Read the full article below! Well, the easiest way is to keep the bedding in the nesting boxes refreshed and replaced as needed. Each morning I 'fluff' the straw in the nesting boxes and check for poop. I remove any dirty straw and replace it with fresh, clean straw. Chickens generally will only poop in the nesting boxes if they are sleeping in them at night. Often young pullets will try to sleep in the boxes instead of on the roosts with the older hens. To prevent this, take any little ones out of the boxes and place them onto the roosts after dusk. And be sure your roosts are positioned higher than your boxes. If this still doesn't prevent them sleeping in the boxes, block the boxes just before dusk. All the chickens will be done laying, so the boxes can remain blocked until you let the chickens out again the following morning. I have tried putting an upturned egg basket or a cardboard box in each nesting box, I've tried blocking the boxes by wedging a piece of cardboard across the front, but determined chickens have always managed to push their way in and wedge themselves into the box. So after a bit of trial and error, I have found this 'hack' is the easiest, most inexpensive, and effective way to block nesting boxes from hens wanting to sleep (or be broody) in them. Nail a single nail to each of the four corners of your row of boxes. Attach your piece of wire fencing to the four nails and then trim it to fit. Bend any rough edges in to avoid injuries. Remove the wire each morning and put it up again each day in the later afternoon just before the chickens turn in for the night. -Now you can easily put up and remove the wire as needed without any trouble. You can also fashion a block for just one box if you have a broody hen hatching eggs in that box. The day the eggs are due to hatch, block the box so the chicks won't accidentally topple out before you can move them and mother hen to a safer, ground level, spot. This is also a great way to deter broodies you are trying to break. This box blocker will foil the efforts of a persistent broody hen.